It’s not often that myself and my partner Nicola manage to get a child free weekend, but last weekend, with the help of Grandparents, we were able to pack the car up and headed over to the Lake District, and what a great weekend it was. Baring in mind that this wasn’t a ‘photographic’ weekend away, there was still time a grab a few shots here and there. We arrived on Saturday to glorious sunshine and blue skies, although it was freezing cold! After checking into our lovely little guest house The Coppice in Windermere, we grabbed a coffee and headed out on a late afternoon walk to Bowness-On-Windermere. 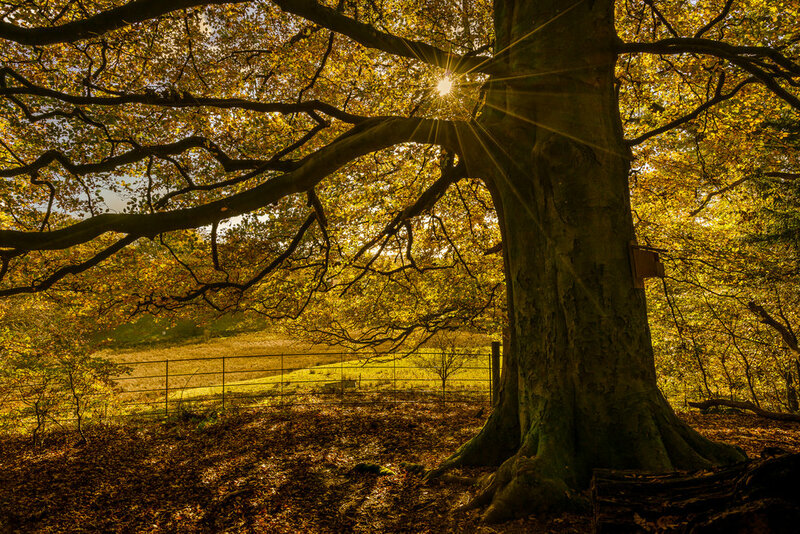 Autumn colours are just hitting their peak in The Lakes and it was stunning, oranges, yellows and greens the leaves lit up by the late afternoon sun, heavy shadows and light cutting through the trees. A beautiful start to the weekend. 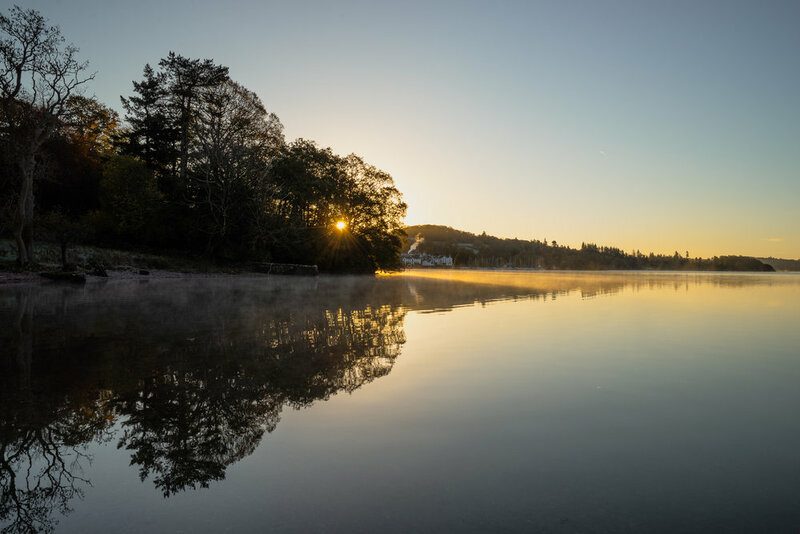 I made my decision at this point that with the sunny weather, and cold temperatures that I would head out the following morning down to Lake Windermere, hoping for a good sunrise and some still waters to catch some reflections on the lake. So I set my alarm for the morning. It wasn’t the easiest getting up the following morning, after a lovely evening meal and a few beers, the clocks going going back helped a little and I was off out before breakfast. I drove down past Bowness and managed to find a spot to set up nestled between the large and quite grand properties that adorn the south west side of the lake. I knew as soon as I’d set out that the wind was a little high, so the chances of any reflections were slim, although I held out a little hope that it would calm a bit as the sun came up. It didn’t, but the sunrise didn’t disappoint, great colours and just enough low lying cloud sweeping over the tops of surrounding mountains to create a bit of atmosphere. I grabbed the Formatt-hitech filters out of my bag and set up to do some Long Exposure Panoramic shots, giving the exposures about 1 min each to flatten out the water and give the clouds a sense of movement. So not quite what I had planned for the morning, but nothing new there, we can’t control the conditions so we just have to go with what we are presented with. And all things considered I was quite happy with the results. 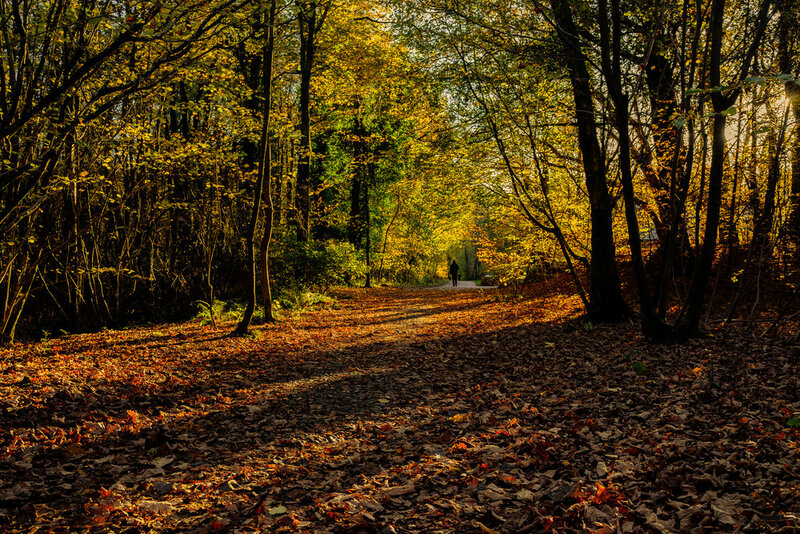 We spent the rest of the day with with a visit to Wray Castle, and some lovely Autumn woodland walks, with some visits to a few of the local towns like Ambleside. 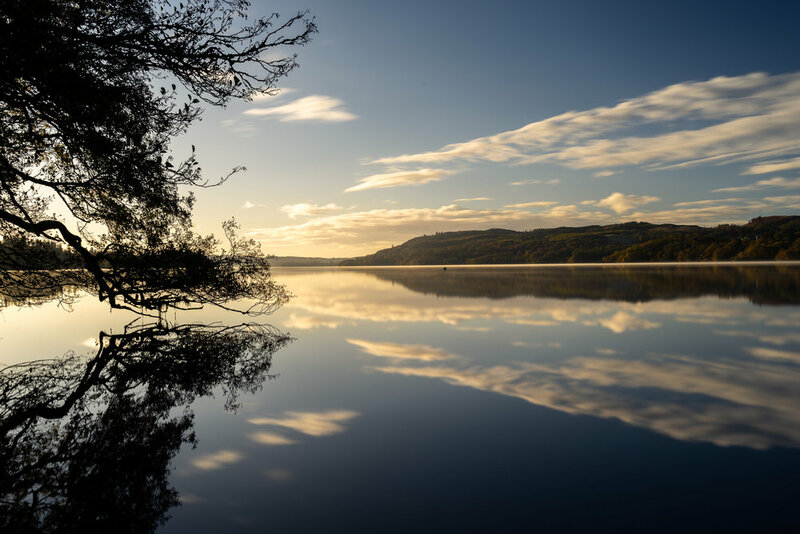 It was on the way to Ambleside that I spotted a different location to shoot the following morning at the Northern end of Windermere. I’d seen the day before. This is where things got a little tricky, there was absolutely nowhere to park or pull the car over. It was on the stretch of the A591 that runs directly along the side of the lake. I drove up and down the road several times and eventually I managed to find a gateway that didn’t seem to be in use(i could have been wrong). I grabbed my gear and headed quickly down to the waters edge, and this morning didn’t disappoint. 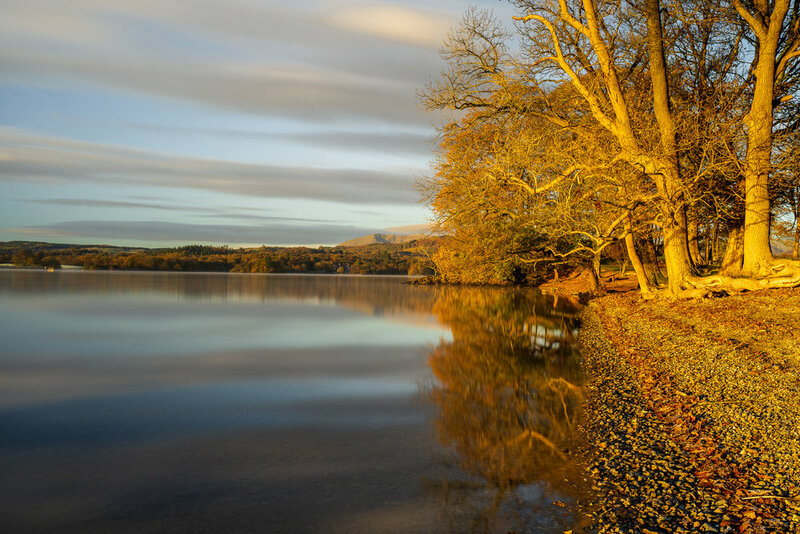 Calm reflective water, some cloud in the sky, beautiful orange glow of the rising sun and glorious Autumn colours. and take your time, giving you more time to think about the subject you’re shooting. I wanted to give the clouds a bit of movement but also flatten out any ripples that were appearing on the water. I used the Firecrest Ultra 10 stop ND on these, which was giving me an exposure time of just under one minute, coupled with the Firecrest circular polariser to remove and harsh light reflections from the surface of the water. A fantastic weekend in a beautiful part of the world. 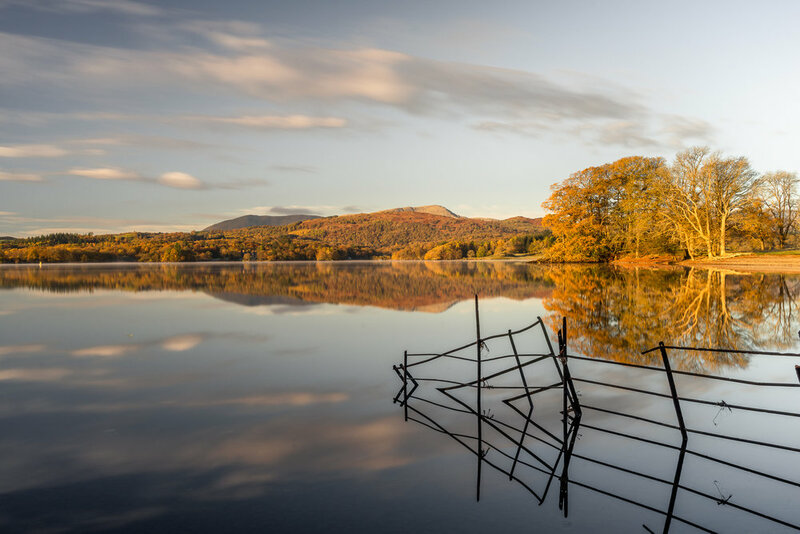 Autumn has to be one of the best times of the year to visit The Lakes, and likewise one of the best places to visit in Autumn. The colours are increadable, the lakes surrounded by the mountains give such a great backdrop for photography. Already planning a longer visit next Autumn!